Supercar Hire from Classic Parade - The UK leader for supercar rental. Looking for excitement with your next supercar hire and a drive of a lifetime? Enjoy the most powerful, beautiful, and engaging supercars available, for a price you can afford. Our vast fleet comprises of a selection of the most desirable supercars for hire in the world. We own and manage an extensive collection of supercars for hire in central London, and we can deliver throughout England and the UK. We are open for enquiries 24 hours a day, 7 days a week, so please don’t hesitate to get in touch. Our supercars are delivered with self drive hire insurance for 2 drivers, and as if that’s not enough, we can deliver &amp; collect from any UK address 7 days a week, even at short notice. Once delivered, it only takes moments to sign your supercar hire agreement, then you can be on route to enjoy the roads of London or anywhere in the UK or Europe. Our clients can visit us in our Knightsbridge office which is located in Central London or we will be all too happy to deliver to West London, South London, East London, Heathrow Airport and Gatwick Airport to name a few locations around the UK. Our supercar hire service will take you wherever you need in complete luxury and style. If you choose to hire from Classic Parade, you will receive pristine vehicles, world standard service, and the most knowledgeable licensed chauffeurs that will make your experience memorable . Give us a ring today for a quote. We will be in touch to arrange the finer details within 30 Minutes. We've teamed up with SurfAir to give our customers the opportunity of flying private on their own chartered jet, to be met on landing with the supercar of your choice. Check out our new section where each car tells a story. Ever wonder what it feels like to drive the champions of the car world? Be it Ferrari, McLaren, Lamborghini, Audi, Porsche, Aston Martin, Rolls Royce, Range Rover, Mercedes-Benz… to name a few. 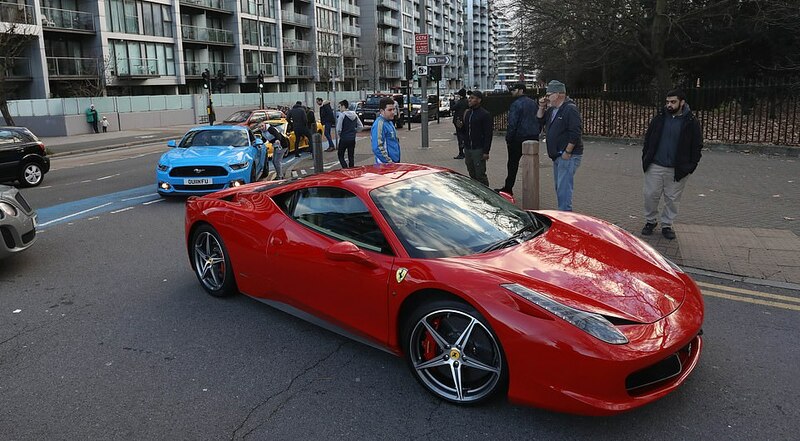 Look no further; Classic Parade, a leading provider of Supercar and Prestige car hire in London and the United Kingdom, offers a wide range of vehicles which are available for rent either in the short run or for long term purposes. Pristine and top of the line vehicles, world class exemplary service, and some of the most knowledgeable licensed chauffeurs is what sets Classic Parade apart in the league of car hiring and other related services. Located in Central London, our Knightsbridge office welcomes our customers, who prefer direct dealing, or we could just as easily deliver to various locations around the UK including West London, South London, East London, Heathrow Airport and Gatwick Airport, to name a few locations. Delivered with self-drive hire insurance for two drivers, our cars for hire are sure to outrank their counterparts in terms of the convenience delivered to the customer. Upon delivery, just sign your car hire agreement and you can be on the road, enjoying your Prestige and/or Supercar Hire without a second thought! It goes without saying our dedication to customer service has been our top priority since day one whether it be through the car chosen by you or even just the delivery and signing over of the car to you. To further put our customers at ease, all of our prices and vehicles include road-side assistance along with fully comprehensive self-drive hire insurance, throughout UK as well as Europe. This brings us to the question; are you thinking of hiring the car for two days and wondering whether to hire for more days? Think no more! Staying true to our dedication towards our customers, we have introduced an added benefit for you to enjoy whilst fulfilling your need for a Prestige and/or Supercar Hire. Upon every Prestige and/or Supercar hire, for three days or more, we at Classic Parade are providing you, our esteemed customers, with a FREE Amazon Kindle! Yes, you read right- a FREE Amazon Kindle could be yours if you opt for hiring your desired car for three days or more from Classic Parade. The Amazon Kindle, an e-reader designed to enable users to browse, buy, download, and read e-books, newspapers, magazines and such, is the perfect device for you. Whilst taking a drive to your destination, with your chauffeur driving at ease- just take out your Amazon Kindle and easily browse through your favorite newspaper, magazine or even a book. The secured ride being a given, your experience will no doubt increase two-fold when you have added advantage to hiring the Prestige and/or Supercar for three days or more. For further details, Classic Parade is the best place to visit- answering all your queries and further detailing all that Classic Parade has to offer! The above are typical hire descriptions representing our Lamborghini Huracan, Ferrari 488 GTB & Spyder, Audi R8 V10 Plus Coupe & Spyder, Aston Martin DB9 Coupe & Volante, Mercedes Benz C63 AMG Coupe, Audi RS7, Mercedes Benz AMG GT S Edition 1. To bring you the best deals possible, our rates fluctuate regularly. Please enquire via our booking form for our latest deals and accurate rates. Signifying Ferraris pinnacle of hybrid engineering excellence. Available for special events and occasions, chauffeur driven and self drive hire. Special terms apply. A revolutionary mid engined plug in hybrid supercar masterpiece by Porsche. Currently available on a self drive or chauffeur driven basis. All requirements assessed individually. A pacemaker with leading technology in the hybrid supercar arena. Available for self drive or chauffeur driven, we also consider bookings for promotional use. Each of the above cars carries a price tag of around £1 million or more making the BMW i8 seem like a real snip at £105,000. This really is a more practical supercar offering many of the advantages of more lowly hybrids such as exceptional fuel efficiency and zero rated V.E.D band. Its 3 cylinder 1.5 litre turbocharged engine produces 231 bhp but an additional 161 bhp from the front mounted electric motor powering the front wheels gives blistering acceleration. It also has a usable 22 mile range in all-electric mode. Hybrid technology now dominates F1 and even Le Mans. Suddenly hybrids are cool! All of our hybrid supercars are readily available for bookings throughout London, the UK and Europe. The thrill of the drive. The sound of the engine. The wind in your hair. Nothing beats that feeling of letting loose (safely, of course) when you're behind the wheel of a supercar. We've compiled a list of 10 epic driving routes around the UK to help you really enjoy your rental experience. Our Prestige and Supercar Hire service in London and the UK provides an excellent platform to impress new clients in a unique way. The spectacular atmosphere in the Lamborghini Huracan and exceptional power in the Ferrari 488 GTB is perfectly suited to impress and celebrate success with heavy impact. Our supercar hire service provides a nice opportunity to build relationships with clients and suppliers in complete style, furthermore our service features market leading marques, the highest specification of vehicles, and European wide assistance. Classic Parade lists all of the events in England. How about enjoying a supercar to get you from A –B whilst visiting the city, town or village of your event, drive around like a rock star in a Lamborghini while dressed as like Elton John and sample some local cuisine in a fabulous city setting. Dance, sing, party, comedy, art, cinema, poetry, classic lifestyle and even whistling like a bird are all part and parcel off typical English events, shows and festivals. Would you like to sample English tradition? England is the proud designer of the social season calendar of winter and summer events. Proud to be in the UK? The UK is rife with opera, glorious gardens and perhaps the major sporting events such as horse racing and rowing to only name a few.